Clip vs. Magazine: What’s the Difference? Home » Clip vs. Magazine: What’s the Difference? When writing on any subject, it’s important to have a working knowledge of the terms used by those in the community about which you are writing. If you are writing about basketball, you will want to acquaint yourself with the rules of basketball. If you are writing about music, you will want to know the nuances of various musical genres and how they differ from one another. Similarly, if you are writing about firearms, be it as a journalist for a news story or as an independent short story writer, you will want to familiarize yourself with the various terms used to describe firearms. The terms clip and magazine are commonly used within firearms communities, and they are widely misused outside of those communities, so today I want to clear up any confusion between these two terms. What is the Difference Between a Clip and a Magazine? In this article, I will compare clip vs. magazine. I will explain in detail the meaning of each term and how it relates to a firearm. Plus, at the end, I will show you a helpful trick to use when choosing clip or magazine in your writing. What does clip mean? An ammunition clip is a device used to store individual rounds of ammunition together as a single unit that is then ready for insertion into the magazine of a gun. A clip is a very simple device that is usually made of a steel stamping. 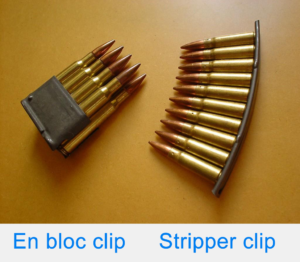 There are various kinds of clips, the most common of which are called ­en bloc clips (left) and stripper clips (right). Again, these devices are used for loading ammunition into the magazine, which then feeds the individual rounds into the firing chamber. For rifles with an internal magazine, the clip loads the bullets into the firearm itself (see image below). Some rifles with detachable magazines can be loaded with clips, but this is relatively uncommon. For all of the confusion surrounding clips vs. magazines, clips themselves are relatively uncommon, as most modern firearms do not use them at all. What does magazine mean? A magazine is a device or chamber for holding a supply of cartridges to be fed automatically to breech of a gun. It is the area from where ammunition is pulled and put into the firing chamber. As I mentioned under the clip section, a magazine can be integral to the firearm (an internal magazine) or it can be removable (a detachable magazine). In either case, the magazine is the area of the gun that feeds ammunition into the chamber. Most modern day pistols and many rifles use detachable magazines. The magazine is filled with ammunition by hand, sometimes with a clip, and it is then loaded into the gun. The magazine then feeds individual rounds of ammunition into the chamber through a spring-loaded follower. While not all guns use clips, all guns, with the exception of revolvers, have magazines. As you can see, the difference between magazines and clips is quite clear. A clip is used to load a magazine, and a magazine feeds ammunition into the chamber. 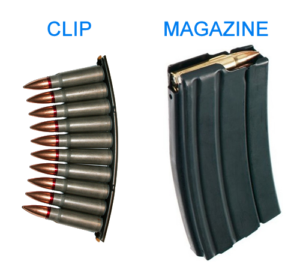 But, if you won’t be able to remember all of this for the future, here is a helpful trick to remember clip vs. magazine. Think about these two terms outside of their firearms context. What is a clip? A short sequence of TV or radio. Or perhaps a newspaper of magazine clipping. A clip is something small. Smaller than—say—a magazine. What is a magazine? A magazine is a full publication, sometimes 100 or more pages. If you can remember the difference between a magazine and a magazine clipping, you can remember the difference between a clip and a magazine. A clip is a small device that usually holds no more than 10 rounds that is used to load a larger magazine. Magazines can carry up to 100 or more rounds, just like the pages in a magazine publication. 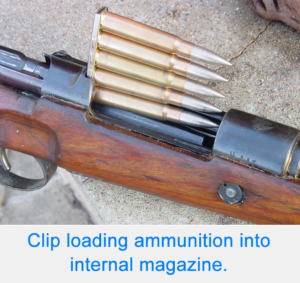 Is it magazine or clip? If military history is one of your favorite subjects, you may already know the difference between these two terms, but there are a lot of writers who aren’t so sure. A clip is a device used to load a magazine. A magazine is a device or holding area where ammunition is feed into the chamber of a firearm. 1 What is the Difference Between a Clip and a Magazine? Maybe vs. May Be: What’s the Difference? Afterward or Afterwards: What’s the Difference?